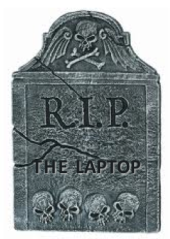 For anyone wondering why I haven’t posted much lately, three weeks ago my portable laptop became too unreliable to trust with writing. First the tabs I had open kept crashing on me so I couldn’t even keep one open. Around the same time it insisted my flash drive stick had errors only to scan it and find it clean. Then another area of the hard drive crashed which led to me to believe I could not risk my stories with it. As a result of all this, the laptop has been declared deceased and I am without any computer to use at work where I’ve done most of my weekly writing. Now, I still have my desktop at home, but my daily commute (round trip) is between 2-3 hours which means I’m not in much of a writing mood when I finally get back after a long day at work. Once I get home, I wish to spend time with my honey more than anything, plus I’m pretty tired. In good news, I will have a new laptop in another 2-3 weeks . So until then my writing and online availability will be more limited. I’ll see you all when I can until then. In the meantime be well and I’ll pop in when I can. While you’re waiting to see more here, please take comfort in knowing that what little computer time I’ve had has not been wasted. Helen and I have been very busy on getting ” The Vampyre Blogs – One Day at a Time” ready for release on Black Friday/Cyber Monday. This anthology has grown to 25 stories (a third of which are “All-New” never before seen tales that were created just for this collection). While Nathan appears in over half of the tales, not all of them focus on our favorite vampyre. Helen and I see The Vampyre Blogs as an ensemble piece so you’ll be getting stories involving Otto, Lisa, Marisa and others who’ve appeared not only in the vampyre books, but also other books in the Para-Earth Series. So please stay tuned and know that more new stories will be appearing here again soon. And thank you all for your patience and support.